"I invented this fresh and easy recipe when I found myself continually invited to summer potlucks, and I needed a no-fuss dish to make. You can even make this the day before. 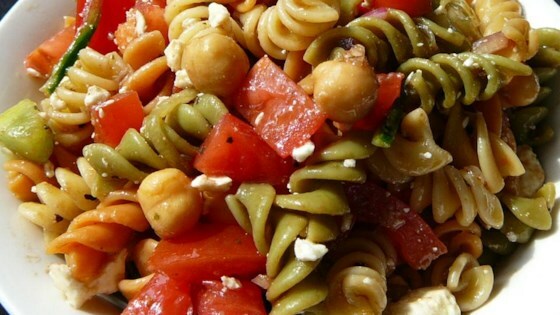 A quick, easy, and healthy pasta salad that is great for potlucks and always a crowd-pleaser." Stir garbanzo beans, grape tomatoes, cucumber, black olives, red onion, olive oil, garlic, balsamic vinegar, lemon juice, basil, salt, and black pepper in a large salad bowl. Bring a large pot of lightly salted water to a boil; cook the rotini at a boil until tender yet firm to the bite, about 10 minutes; drain. Gently fold pasta into salad and chill 15 to 20 minutes to blend flavors. Mix feta cheese into salad. Excellent! We made our own version without olives because I hate olives. It was really good!!! Will definitely keep this in the rotation. I followed the recipe exactly and it was great! I did , however, then add a few more tablespoons of the balsamic vinegar just to add more taste to our liking. Will definitely make again! Great recipe! I found it kind of dry so I doubled the dressing recipe and it was just right! I made it as per the recipe. It was tasteless so I added "salad supreme". I also added another tablespoon of balsamic vinegar and a 1/4C of Italian dressing. We really enjoyed this pasta salad. I did add more salt and pepper. Also added mini pepperoni. Will definitely make it again.